LED Corporations, Inc.’s LED lighting products were specified to create a dazzling and captivating lighting scheme on the rooftop of Miami South Beach’s new Anthropologie location. LED Corporations, Inc., Announces the completion of the much talked about captivating lighting project designed and installed at the new South Beach Anthropologie store located at 801 Lincoln Road in Miami, FL. 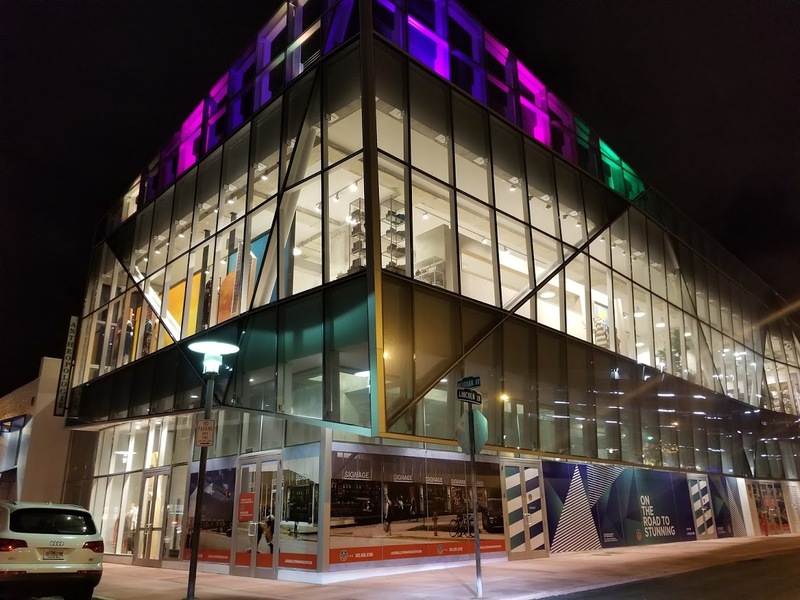 The lighting fixture of choice was the ’ 50-watt RGB LED outdoor Flood lights that are DMX controlled were specified for the project to create a multicolored look washing against the building’s architectural steel beams. LED Corporations LED lighting products were purchased specifically for the project by property management firm Terranova Corporations, the property management firm responsible for the development of the new Lincoln Road Anthropologie location. “We are pleased that our innovative LED lighting products have been selected for use in this project. We strive to design and produce products that are both functional and lend themselves to achieving the artistic ideals of project designers,” says LED Corporations CEO, Anthony Florence. The Miami South Beach building housing the Anthropologie store is designed by architect Shulman + Associates. The new location is positioned mere blocks away from Anthropologie’s current South Beach location. Anthropologie’s new shop features 2,000 square feet of ground floor retail space coupled with the building’s entire second floor, totaling 10,000 square feet. 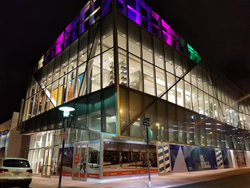 The project will connect existing structures with a new 27,077 square-foot property featuring an eye-catching glass exterior. The building at 801 Lincoln Road is the first of two buildings currently under development by Terranova Corporations. A second retail location at 723 Lincoln Lane will feature 42,000 square feet of retail space, home to a future Marshalls store. The development of the two locations is the realization of a longstanding dream to expand Lincoln Road along Miami South Beach side streets, extending to 17th Street. LED Corporations is thrilled to be a part of this strategic project with the goal of attracting business to the expanded retail area. The area has drawn attention from multiple New York investors, and the expansion will allow an increased presence from current national and international retailers such as Apple, Nike, and Gap. Visit LEDCorporations.com or call 800-560-7850 to learn more about the innovative LED lighting products and supplies offered by our company. We are a manufacturer, wholesaler, and distributor of innovative, high-value LED lighting products and accessories. Headquartered in Palm Beach Gardens, FL, and provides quality interior and exterior illumination products suited for commercial and industrial applications across the globe. Offering a vast selection of in stock products paired with unmatched customer service, We aim to help electricians, electrical contractors, and LED product suppliers grow their businesses and best serve end users.